Yippee, I've sprung into action and joined in with the Spring for Cotton Group Sewing Challenge this month. It's my first time in the same climate, northern hemisphere for one of Rochelle at Lucky Lucille's sewalong. When I lived in Australia, I felt at odds sewing for the opposite seasons, I was all spring for the Sew Weekly, while everyone up north did the fall colour palates! NOW I'm in Shanghai, I'm all for it! I'm enjoying the blossoms and the newness and really can see it's a beautiful season and there's such an awakening that's so different from Melbourne's spring. Just everything is really coming alive. 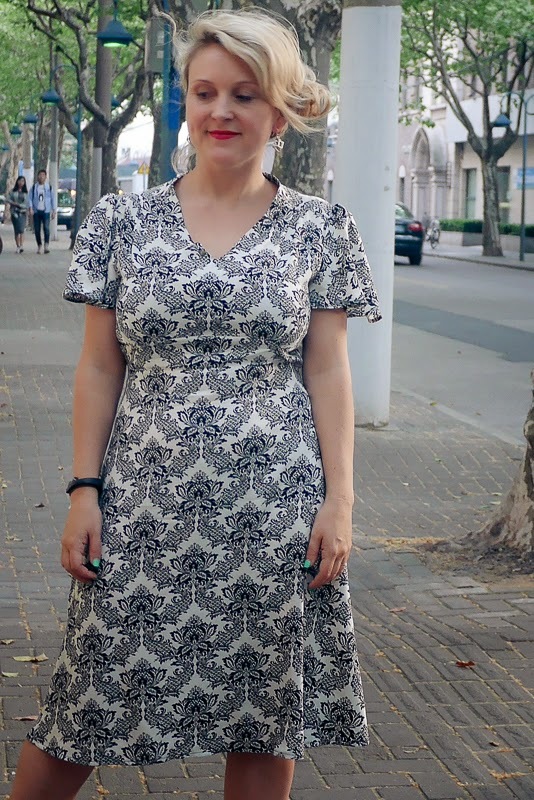 So the Spring for Cotton group challenge is about sewing a vintage pattern paired with cotton fabric, and I'd stumbled upon a huge collection of cotton at the Fabric Market so chose this wallpaper-like print because it looked a little art deco to me AND Shanghai has lots of art deco or 1930s influences around town. 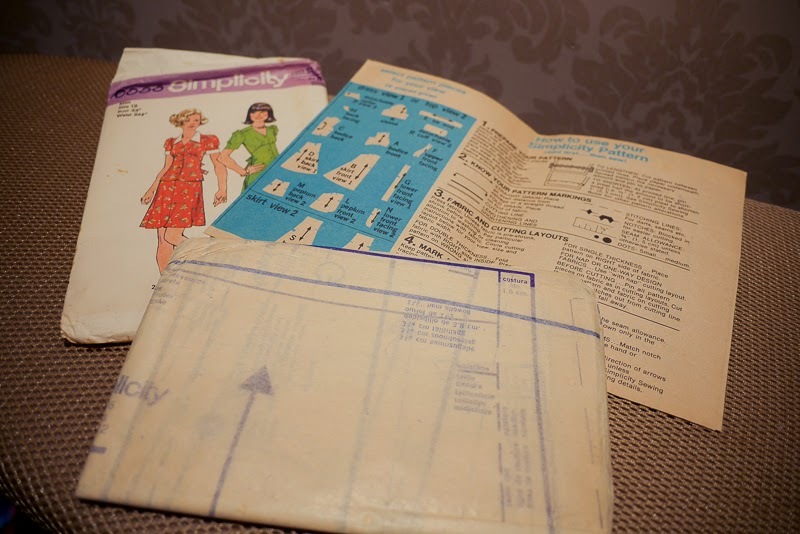 For a second, I didn't think I had any vintage patterns with me so was wondering if I'd have to draft something, but then remembered I'd bought a couple of new (to me) patterns from the op shop in Brisbane in March when we'd quickly visited family. And it hadn't even been cut! W o W! I *almost* changed my mind on this pattern at the last minute... just because all the #TeamCulottes were floating around in my instagramz and bloglovin' reader this part month... and while at 4 foot 11 (150cm) I am not on Team Culotte's sadly, I am on Team Palazzo (if there is such a team) because even short girls can pull that off (in my opinion of course!). And then I thought I could sew this wallpaper fabric into palazzo pants instead... but I don't have a pattern yet. By Hand London's Holly was on the way and just arrived yesterday, so watch this space! But considering there were lots of this fabric, and other colours at the fabric market, I can always go back for some more once I get into Team Palazzo! The fabric has a lovely drape for cotton, and a nice bit of stretch on the diagonal, so don't know if that makes it 100% cotton, but I had no extra info from the fabric market lady. But, it makes this 1970s dress pattern give proper credit to the earlier part of the 20th century, I reckon! 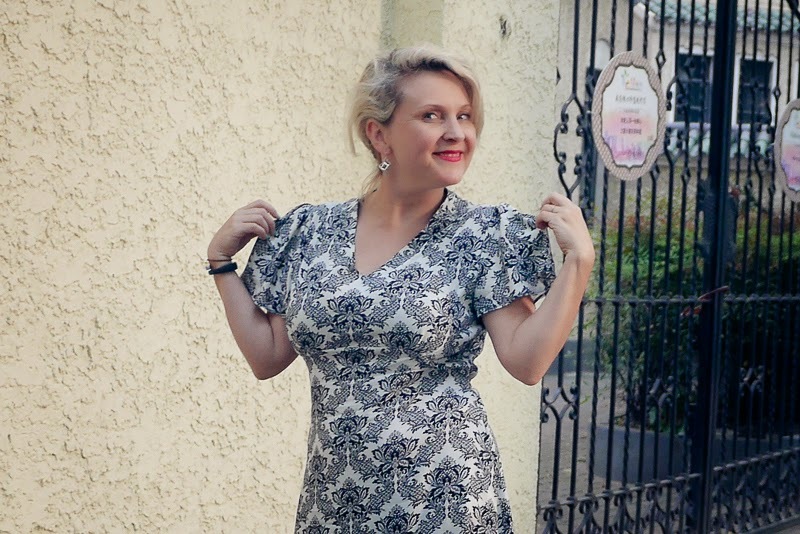 The fabric was pretty straightforward, but I made LOTS of pattern changes to this vintage Simplicity 6086!! First up, I wanted the dress shape, especially the bodice gathers, but not the buttons! I AM wanting to learn new techniques this year, and you might not realise but I ALWAYS opt out of the trickier techniques. I'll get to them eventually, but I wanted a dress I could wear STRAIGHT away (it's MMM coming up soon!) so going for my old gusto sewing here. Instead of the buttons, I put all pattern pieces on the fold ignoring the overlapped flap (there was indication on the pattern pieces which bit was the button line, so followed that) and carefully matched the wallpaper as best I could, and quite happy with the pattern matching here along the front line! Because I didn't do buttons, I had to add a side zipper (very invisible!) 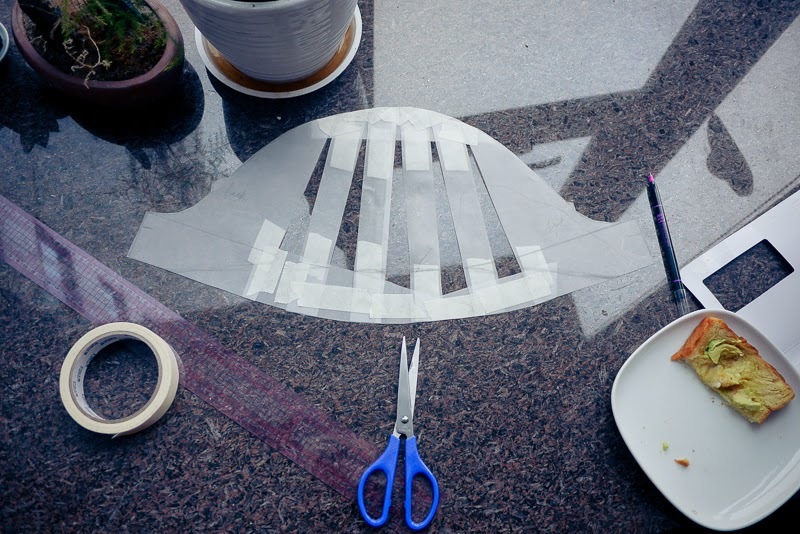 to keep the lovely shape of the back bodice piece. Pretty much, because of the pattern matching, I cut each pattern piece at a time, instead of just chuck all of them on the fabric at once and cut... so I put it together very easily, all before cutting the sleeves. 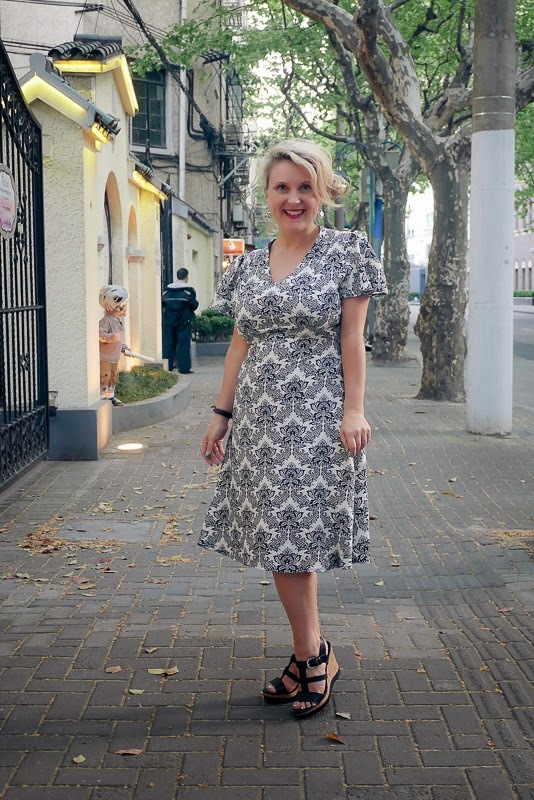 Even though I cut a little larger than the 34 bust size (I'm now a 36 I think - it changes!) it is pretty loose fitting but I couldn't take up the shoulder seams because they're those over the shoulder/collar bone sitting gathered ones... which aren't actually *that* gathered in this pattern. Next time I'm going to make this a lot more noticable. 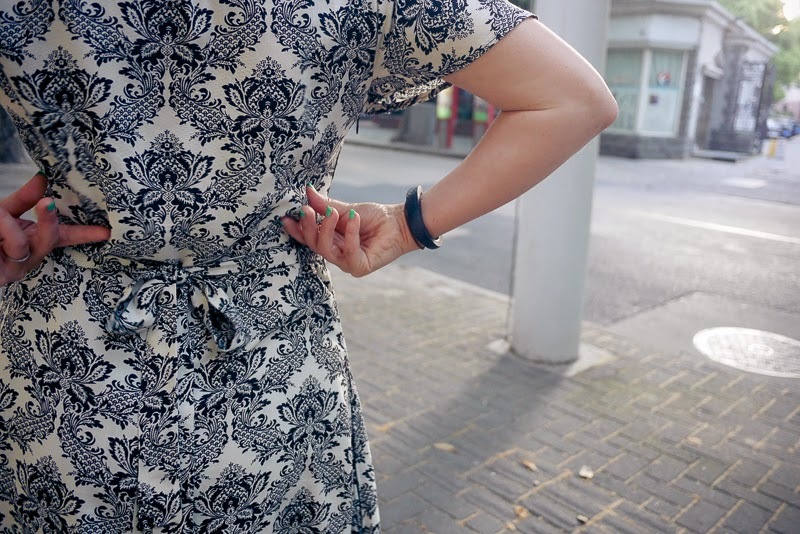 And THEN: I ummed and ahhed about the sleeves. Very happy with the floppy sleeves! They move around like the skirt hem, however next time I will slice a bit off the back bodice to make them sit up on the shoulder a little more... as my shoulders look a little wide in the photo above! AND because I made the front pattern pieces on the fold instead of with buttons, the facing provided wouldn't work, so I followed this V Neck facing/bias binding approach instead. And it could sit flatter and less loosey goosey, but it kinda suits the whole dress that has a fluttery look so why fix it!? 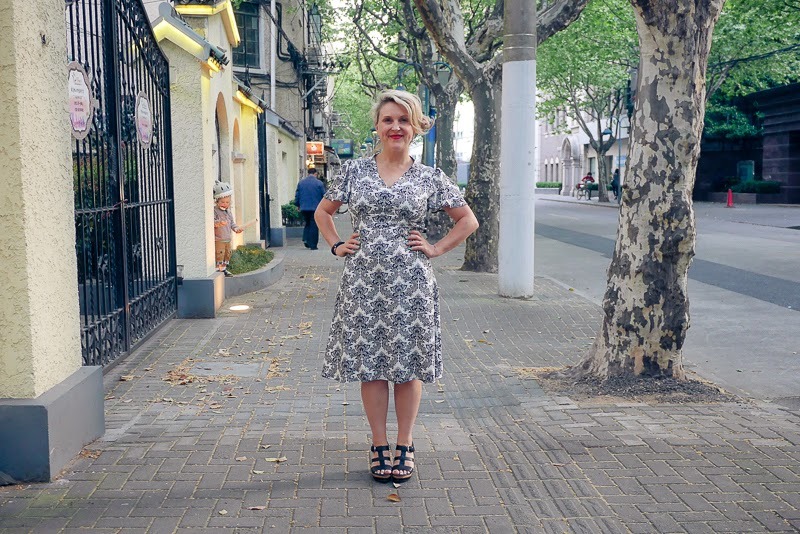 Yay, my Spring for Cotton is a Sassy Wallpaper Dress made in Shanghai! 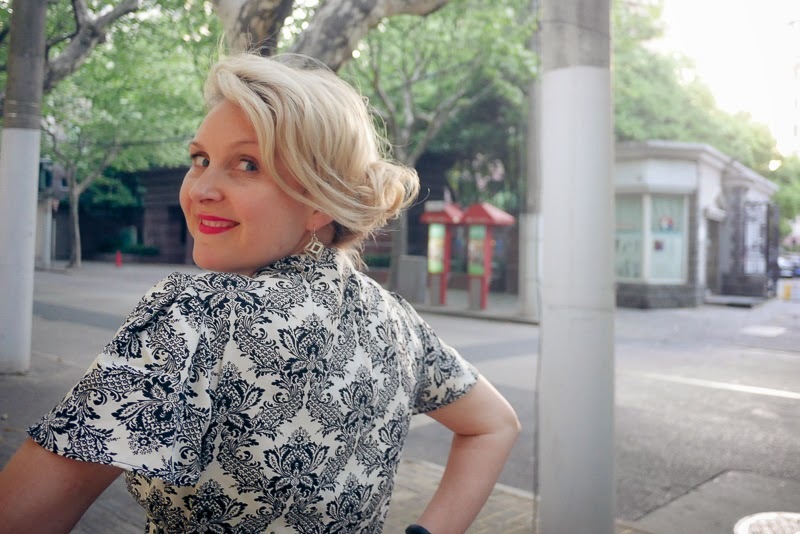 We were on our way out for dinner last night when we stopped for the last rays of light along Huashan Lu, so Husbie was able to take these gorgeous photos. OUTSIDE of the apartment for once! Thanks Rochelle for a lovely sewing challenge!